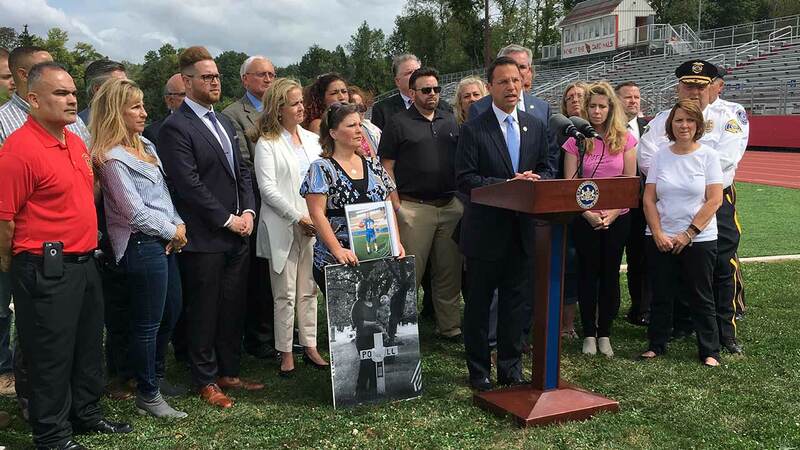 Pictured: Pa. Attorney General Josh Shapiro announces expansion in opioid investigation in Upper Dublin, Pa. on September 19, 2017. UPPER DUBLIN, Pa. (WPVI) -- Attorneys general from dozens of states, including Pennsylvania, are broadening their investigation into the opioid industry as a nationwide overdose crisis continues to claim thousands of lives. They announced Tuesday that they had served subpoenas requesting information from five companies that make powerful prescription painkillers and demands for information from three distributors. Forty-one attorneys general are involved. The probe into marketing and sales practices seeks to find out whether the industry's own actions worsened the epidemic. "We have the resources, expertise and legal authority to take on this fight, and we aren't letting up," Pennsylvana Attorney General JoshShapiro said. "We're following the evidence wherever it leads so we can change behavior and save lives. Make no mistake: if the law was broken, this team will find it, and we will take action to change the course of this epidemic." "The advantage of the multi-state approach is that it's not simply about providing a paycheck for damages to states," Jepsen said. "It provides the opportunity to address broader policy concerns and industry practices." The Healthcare Distribution Alliance said in a statement that it's not responsible for the volume of opioid prescribing but that it does want to work on solving the public health crisis. "While distributors play a vital role as logistics companies, to suggest that they are responsible for the volume of opioids prescribed lacks a fundamental understanding of how the supply chain works and is regulated," John Gray, the group's president and CEO said in a statement. "Distributors have no ability to influence what prescriptions are written." PhRMA, which represents drugmakers, declined to comment on the investigation but said it is trying to deter and prevent drug abuse. The group and some of its members met Monday with New Jersey Gov. Chris Christie, a Republican who is the head of President Donald Trump's task force on opioids, and pledged to try to develop technologies to reduce the risk of addiction and abuse. The drug companies targeted in the requests for information are Endo, Janssen, Teva and Allergan. The attorneys general also asked for more information from Purdue Pharma; an investigation of that company was announced in June. The distributors involved are AmerisourceBergen, Cardinal Health and McKesson. The industry group America's Health Insurance Plans said in a statement that it's already working on using education, prevention and other means in an effort to eradicate addiction.